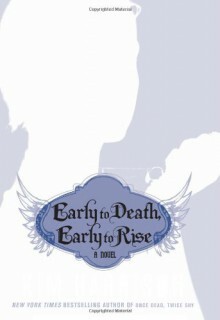 Madison Avery is seventeen, dead, and in charge of heaven's dark angels-all itching to kill someone. Having discovered she is really the Dark Timekeeper who's fated to rule over Dark Reapers (the ones who kill humans that are fated to turn bad), Madison swears she doesn't believe in fate and decides it's time for a change in the system. Along with some unlikely allies, she forms a rogue group of reapers who definitely don't adhere to the rules of the Heavens-and don't know quite what they're doing, either. But as she grapples with the terrifying new skills that come with being a timekeeper, Madison realizes she may not be prepared for what lies ahead-unless she gets some seriously divine intervention. As the sequel to a book I enjoyed I was predisposed to like Early to Death. It had the same cute tone and it boosted it's likeability by having characters besides Madison that Harrison delves into. It's really short so the ending runs into you like a telephone pole you didn't see coming.